Types of acorn and section of an acorn. Of all the native trees in Britain, the oak is considered the most typical. It is the symbol of strength and endurance, as we can see in expressions like 'hearts of oak', and it deserves to be so. The wood is very hard and strong, and the tree so deeply rooted that the strongest gales seldom can blow it down. The oak tree lives to an immense age; it yields good timber at about 120 years, but the tree may live much longer. 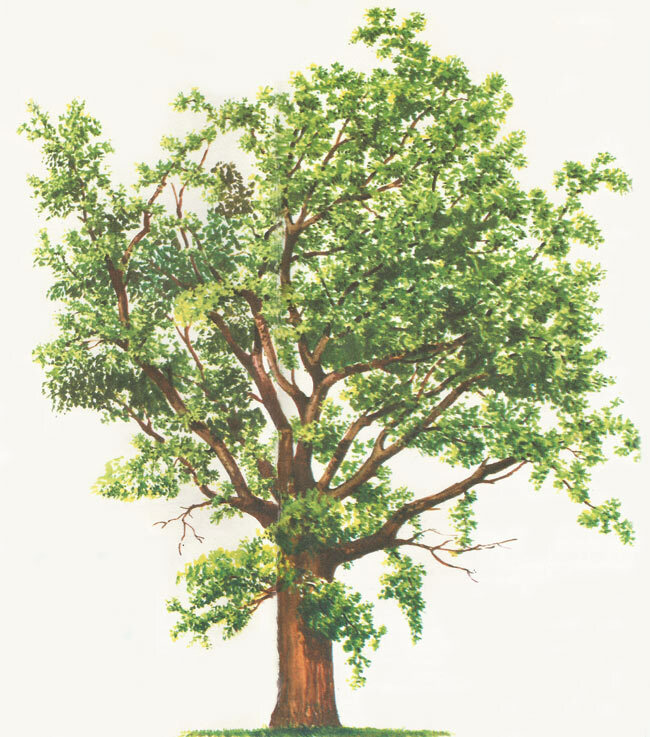 It is possible that the oldest oaks are 1,000 years old or more. We can not tell their age by counting growth-rings, because they cease growing long before they die. We speak of 'the oak tree', but there are, in fact, two native British species, several more European ones, and a world total of about 500, many of which are tropical. All are included in the genus Quercus, whose common characteristic is the curious and easily recognizable fruit which we call the acorn. Two of those mentioned below are native British trees, two have been introduced into the country, and the fifth, the Cork Oak, is a European tree of great economic importance. This is the dominant species over most of Britain. It is distinguished from the Sessile Oak by the fact that the leaf-stalks are short, while the stalks on which the acorns are borne are long, and the acorn itself is rounded at the end. The specific name, robur, is Latin for strength. In the Sessile Oak the acorns are 'sessile' – that is, they 'sit' on the stems which bear them, instead of each acorn having a stalk of its own, in addition, they are tapering and pointed in shape. The leaves, on the contrary, have longer stalks than those of the Pedunculate Oak. It is easy to identify these two trees in summer or winter, as the leaves are present in summer and it is easy to find acorns in winter. The Sessile Oak is dominant in Wales, but occurs here and there throughout Britain. This is a southern European and Balkan tree, which has been introduced into Britain. It grows fast, but its timber is not as durable as that of the British native oaks. It can be recognized by the narrow-shaped leaves with pointed tips and by the acorn cups, which are hairy. This tree is very different in appearance. It is hardly recognizable as an an oak at all. However, if you look on the ground of a Holm oak, you will find acorns, the fruits that distinguish the genus Quercus all over the world. This is a Mediterranean tree, recognizable by its oval, dark green, leathery leaves, which remain on the tree through the winter. The wood is very hard and heavy and is used for cabinet-making. This is another evergreen species, which grows in southern Europe, especially in Spain and Portugal, but also in Italy and in Morocco. The very thick bark is stripped from the living tree and cut up to yield the cork which is sold commercially. 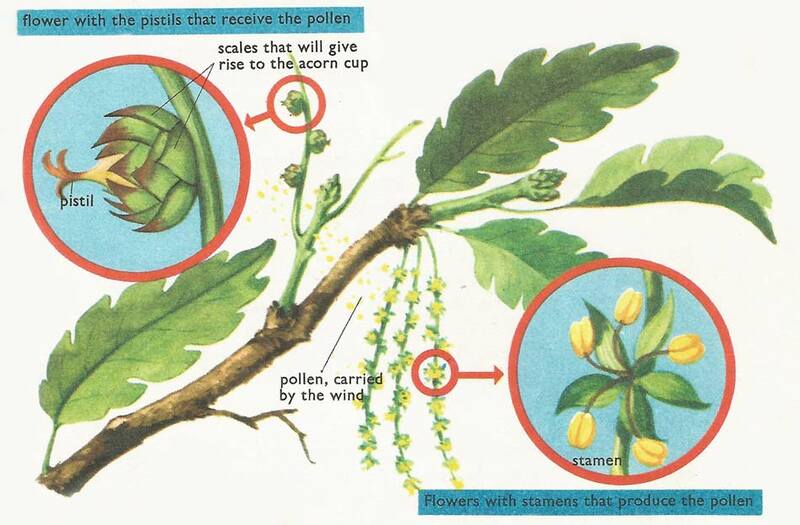 Pollination of the oak flower is effected by the wind and is of a type known as anemophilous. The acorn is the fruit of the oak. Acorns are valuable as food for pigs. Galls are growths that appear on plants, caused by the action of tiny insects. More types are found on oaks than any other plant. The 'oak apple' is a typical gall, a spongy, pinkish mass caused by a minute wasp, Biorhiza pallida. 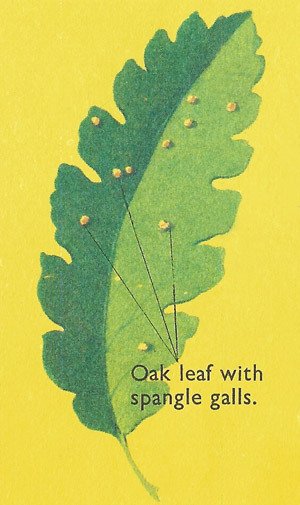 'Bullet' or 'marble galls' are round, hard galls that are also common on oak trees; whilst the ones shown here, growing on a leaf, are known as 'spangle galls'. Oak timber is very strong and, on account of the tannic acid it contains, very resistant to water. It is used for under-water construction, for railway sleepers, and for making trucks and railway rolling stock, which must stand up to hard usage. Oak makes good furniture, and casks for maturing brandy, too, are traditionally made of it. Finally, oak yields high-quality charcoal. The oak has played a very important part in history of Britain. The wooden ships, on which sea power depended in the years between the Armada and Trafalgar, were built of oak. Not only straight timber was needed: the natural forks and bends of the great gnarled branches were cleverly built into the ships and gave them enormous strength. The weald of Kent and Sussex was once a huge oak forest. Iron ore occurs in the Wealden strata, and this great forest was largely destroyed to produce charcoal for smelting the ore. Smelting iron ore with coke is a comparatively recent practice. Until recently, the tanning industry depended on tannin from the bark of oak trees, and the same substance, derived from certain oak galls, used to be an essential ingredient in the making of ink. The cork used commercially is made from the bark of a peculiar species of oak, Quercus suber; it may be an inch or more thick, and it is removed from the living tree by making cuts around the trunk. After removal the barks grows again. The first, naturally grown crop of bark produces cork of low quality, suitable only for making cork mating, High-quality cork is the product of regeneration of the bark after the first and following cuttings, which can be repeated every seven years. An ordinary cork consists of thousands of tiny air cells, which is why cork floats so well and why it is used for insulating, or keeping out heat and cold. Uses of cork include the familiar bottle-stoppers, cork matting, life-preservers, floats and buoys, hat linings, and shoe soles. It is also ground up and made into corkboard for insulation, air-conditioning, and deadening of sound. species robur, petraea, ilex, etc.